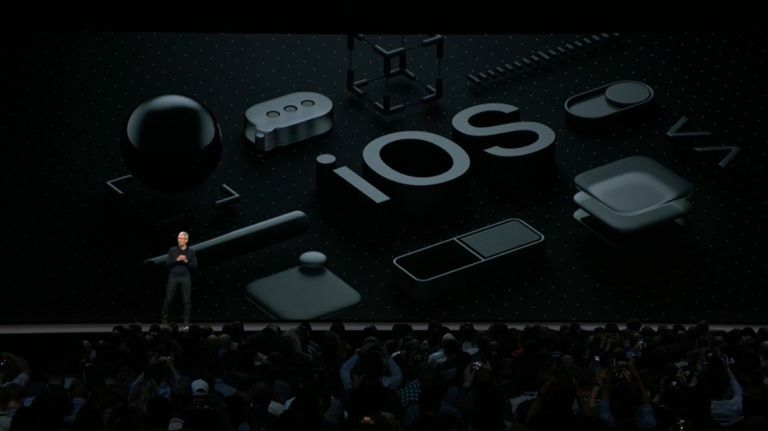 Apple's Worldwide Developers Conference kicked off yesterday with the WWDC 2018 keynote event and, as we expected, a lot of new features and functionality has been revealed for iOS 12, watchOS, tvOS and macOS, too, with the latter even getting a dramatic upgrade into macOS Mojave. The biggest focus though was hot new features for iPhone users running iOS 12, with a raft of new functions landing across the range. This focus on iPhone is only natural considering the insane popularity of the phones worldwide, and their incoming free iOS 12 update should see both old and new iPhones a like really be taken to a new level in terms of usability. Here are the 12 new iOS 12 features unveiled at WWDC 2018 that impressed us most, from smart new ways to control and limit the amount of time you spend in certain apps, through crazily expressive new virtual avatars, and on to amazing new uses of augmented reality technology. Using the new Siri Shortcuts functionality iPhone users can create custom stacks of actions for the voice assistant to perform upon hearing a set command. So, for example, if you are heading out to work in the morning (which is something you do frequently), then you can stack Siri to give you a weather update, traffic report, and then play some of your favourite music as soon as you say "Siri, I am going to work". Obviously, this also works with Apple HomeKit, too, so you could always get Siri to do things like turn your lights off in the stack as well. Animoji, Apple's cute animated animal personas are back and upgraded in iOS 12 on iPhone, with new creatures like koala and T-rex added, among others. These animoji now support tongue detection as well, meaning that you can wag or stick out your tongue while in animal form now for added personality and expression, too. Memoji are very similar to Samsung's AR Emoji and allow iPhone users to create their very own cartoon human avatar, which can be then styled and posed to suit the occasion. Creation of the Memoji is very quick and, once built, can be used in messaging and other applications. iOS 12 is fast, very fast. According to Apple's tests on an iPhone 6 Plus, apps laucn 40 per cent faster, the system keyboard loads 50 per cent faster, and the camera now opens 70 per cent faster as well. This is achieved as Apple has tweaked how the OS ramps up processor power delivery, hitting optimal performance faster, and tailing off to preserve battery after the fact faster too. iOS 12 supports grouped notifications, which not only stacks waiting notifications into same-app columns, which can then be exploded out and interacted with as desired, but also grant the user more control over how they are delivered in terms of vibration and sound. iOS 12 comes with ARKit 2, which has been designed to take mixed world augmented reality experiences to the next level. For example, the new framework allows developers to create shared experiences, where two different users using two different iPhones can see the same AR experience when running the same app. Tapping into Apple's work in augmented reality, the new Measure app allows user to measure real-world objects, like boxes, furniture, pictures, and more, by simply highlighting a start point through the device's viewfinder and then dragging to an end point, with single line or multi-line 3D objects capable of being measured. Seems like a useful function for quickly ascertaining the approximate size or width of an object or space when all you have to hand is your mobile. A small but very welcome upgrade, Apple has confirmed that its in-car platform CarPlay will add support for Google Maps and Waze in iOS 12. These turn-by-turn navigation apps are very popular and now will work seamlessly across the iPhone user experience. Group FaceTime video calls are now available in iOS 12 and macOS Mojave and allow up to 32 people to chat in any single group at one time. The Group FaceTime app allows people to join the call whenever, too, allows an audio-only connection from Apple Watch, and features a new floating tile-based UI that grows a person's tile when they are talking to make them more visible to the call's participants. iOS 12 comes with a brand new redesigned stocks app that now also works on iPad, too. The new Stocks apps will support after-hours stock prices and will also include content from Apple News relevant to a user's investments or how the market is moving. The iPhone's new Screentime app in iOS 12 allows users to see detailed reports about how frequently they use their phone and, specifically, individual apps, too. This makes it very easy to see how much time you are spending in certain apps and you can also set limits which notify you when you hit a set usage time. Adults of course can go over these set limits, however it acts as a gentle reminder that a certain usage time has been hit, which for many people will be a good deterrent against overuse. The iPhone's new Do Not Disturb mode in iOS 12 allows a user to mute incoming notifications overnight, for a set time period, or at a certain location. So, for example, if you are attending an event at your daughter's local school and don't want to be pestered while you are there, then this function allows you do that while in its grounds. Apple is totally rebranding its ebook app in iOS 12 from iBooks to Apple Books. The new name comes alongside a refreshed design that places discoverability front and centre, as well as a new Book Store tab that shows off curated collections and special offers. Finally, Apple confirmed that Siri will now work with even more third-party apps in iOS 12. For example, Apple showed off how Siri can now work with Tile tracking devices, with a "Hey Siri, I lost my keys" command activating its geo-location finder functionality.